Who can judge when a decent enough interval has elapsed to make it acceptable to transform human tragedy into mere entertainment? The true events that inspired The Colony (previously Colonia) took place more than 40 years ago but Florian Gallenberger’s risible, multi-national thriller feels crassly insensitive and hopelessly ill-judged as he takes viewers on a lurid journey to the notorious Chilean torture camp Colonia Dignidad. The stodgy ‘Europudding’ tone is set from the beginning in a Santiago where everyone speaks English. 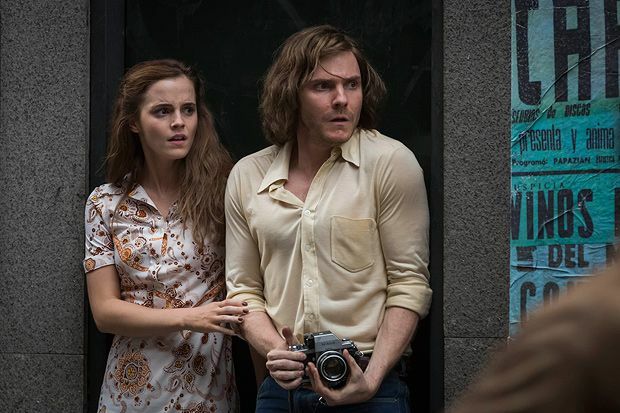 Lufthansa flight attendant Lena (Emma Watson) and her activist boyfriend Daniel (Daniel Brühl) are caught up in the political coup that brings Pinochet to power. Naturally, they just run into the street snapping photographs of the clampdown and are placed under detention. Lena is released but Daniel is sent to Colonia Dignidad, the site of a mysterious, Jim Jones-style religious cult presided over by dastardly villain Paul Schäfer (Michael Nyqvist). As Daniel struggles for survival by pretending to have been left ‘retarded’ by the brain-frazzling torture, plucky Lena goes undercover to rescue him. Posing as a potential convert, she is soon at the mercy of evil nun Gisela (Richenda Carey). The Colony does generate some cheesy do-or-die tension in the final half hour, but most of the time it is hard to take seriously. The storytelling is simplistic, the dialogue makes you wince and Gallenberger seems to linger over the sadistic violence meted out to the women in the camp, which only adds to the feeling of an Eli Roth-esque exploitation effort. In the film’s closing images, we see photographs of the real Colonia Dignidad and briefly learn of the thousands who suffered unimaginable horrors within its walls. That postscript only reinforces the sense that The Colony is an insult to their memory. Selected release from Fri 1 Jul.